They met not long after the war ended, in a time of boundless optimism and hope. They married soon after, promising for better or worse, richer or poorer, until death would they part. While the riches never came, they were never poor, and always grateful for what they had. Some times were better, some worse, but they honored their vows and lived far more years together as man and wife than they had ever lived alone. They were a handsome couple. When he would take her in his arms, and they would glide across the dance floor, there was no more graceful couple in the room. The next war separated them briefly but then they were back together, each doing their part to raise their growing family. Money was tight but they enjoyed their simple pleasures. Sharing a pizza at midnight, after his evening shift with the local police department. Beach parties with fellow cops and their families, singing songs in the glow of a bonfire. And, whenever work schedules would allow, Sunday afternoons at local parks and playgrounds with their young daughters. The years were kind to them, and when they had the chance to retire to a warmer climate, they grabbed it. Still young, in their 50’s, they finally had the time to enjoy some of the things denied them as they raised their family – travel and golf and socializing with new friends. They seized their 60’s. Health issues began to slow them down in their 70’s but still they lived and laughed and enjoyed their time with family and friends. And then their 80’s began to wear them down. Friends not much older than themselves began to fall ill. Some passed away. Others moved away to be closer to their kids. Their world began to shrink to a never ending series of doctors’ appointments, Thursday outings to the senior center and twenty four hour news channels. She fretted about his declining health. He chafed at her concern/nagging. Grocery shopping and housework became more of a challenge. The future looked less and less appealing. Well intentioned advice triggered a move to assisted living. Neither had ever expected to make that sort of a move. No one ever really wants to lose their independence and they were no exception. But it was supposed to make their lives easier. Spare them the effort of cooking and cleaning and taking care of each other. At first, she tried to make the best of it. But the move did not live up to their expectations. She moved in first and he was to follow once he sold their home and most of their possessions. But then she fell, badly injuring herself, and everything changed. The days and nights dragged on endlessly as she sat, depressed and in pain, and slowly deteriorated. His heart broke to see her suffering. He visited her daily, trying to help as best he could. She felt helpless. A burden. He reassured and encouraged and, at the end of the day, alone in their house, he often cried. And he began to formulate a plan to get her back home, with him, where she belonged. For two and a half months, he did all that he could to prove to her, and to others, that he was still up to the task of living independently. He was determined to do as much as he could, for as long as he could. She worried that he was much too tired. He pushed himself to do more. He cooked and cleaned, shopped and managed his own health issues. And he waited to share his plan with her. Through days and weeks of physical therapy and occupational therapy, he waited. He put his trust in the team of medical professionals to work their magic. To see the two of them as more than merely the sum total of their advanced age and complex medical issues. To see the potential that still existed in each of them. And, slowly, the magic happened. Buoyed by the encouragement of the therapists, she worked hard, pushing herself to walk a bit further. To eat a few more bites. To regain more and more of the independence lost since her fall. She amazed the rehab staff, and, in turn, came to believe in herself once again. Finally, their efforts paid off. On the very day of their 65th wedding anniversary, he took his bride home. He was so excited and, if his heart and back would have allowed, he likely would have carried her over the threshold. Flowers were waiting to welcome her. This man, who had barely tolerated shopping in the past, had redecorated their bedroom with new curtains and bedspreads. He prepared a special welcome home dinner and had searched everywhere to find the baby peas and onions that she had always liked. He was so proud of his efforts and she was flattered to realize how much she still meant to him after so many years of marriage. The romance may have waned over the years, but it was heartwarming to see the love that had endured. It’s as if they have been given a second chance to pledge their lives to each other – for better or worse, for richer or poorer. Their future is unknown, just as it is for each of us. But they are facing it together. On their own terms. Determined to do as much as they can for as long as they can. And I couldn’t be more proud of them. 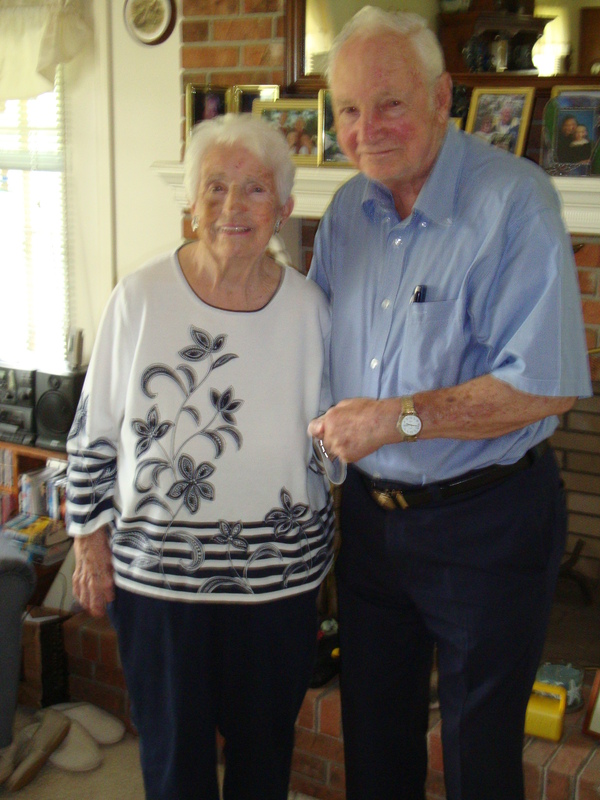 Happy 65th wedding anniversary Mom and Dad. You’re an inspiration to us all. This entry was posted in Uncategorized and tagged Health issues. Bookmark the permalink. What a wonderful story – lesser people would have given up, but your mob are made of stronger stuff! Congratulations to them on their time together and their perseverence. You’re lucky to have them. Thanks Ginny. They are an inspiration. What a beautiful story. True life. 65 years! Wow. Truly an inspiration. Got goosebumps reading it out loud to my love. Thanks so much for sharing. Thanks Frances. So glad you enjoyed it. An inspiring tale of two great people, tugging at the heart strings. You keep the reader guessing all the way through the story, with the ups and downs of your parents’ lives, which makes for very entertaining reading. Finally, in the 2nd last paragraph, we are rewarded with a happy ending, thankfully. A pleasure to read. How beautiful it would be if we all could share the last years with the one we love. I agree. That is why aging at home, with help as needed, is far better than institutional living, no matter how pretty the brochures.